Already know your confirmation number? You can enter your event at any time by typing the confirmation number above. 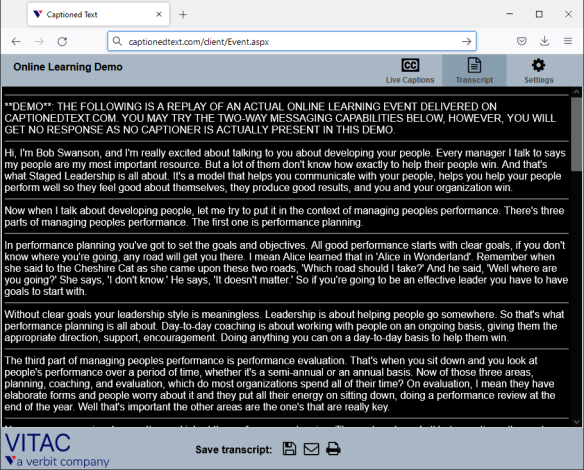 Our Instant Transcripts allows authorized participants to view a copy of the session transcript at any time during the discussion in a separate viewer window from the real-time event captioning. This is a snap-shot of the dialogue up to that moment. Meeting attendees that are late to a call can catch up on earlier dialogue while continuing to view the current discussion at the same time. Meeting attendees can view all of the text from the beginning of a call, meeting, or discussion and the full text is available for distribution and archive immediately at the event’s conclusion. If you have requested it at the time of event scheduling, a Instant Transcripts can be saved by meeting participants directly to their computers at the conclusion of the event. You can use this feature to e-mail captioned meeting notes to anyone within moments of the event's completion and archived meeting records can be accomplished in a single step. The file can be saved in either .html or .txt formats.